"The problem when trying to adjust the table saw fence… the far end of the fence swings back and forth in relation to the front locking end of the fence when the locking lever is released and you try to move the fence to a new setting (while visually using the ruler tape on the Front Fence Rail). This makes it very difficult to make small adjustments in the fence settings because once the Fence Locking Lever is released; you immediately lose your mechanical point of reference. Thus, you are repeatedly unlocking - adjusting - locking etc., until you hope you have achieved the desired setting. Then you make a cut and hope for the best. 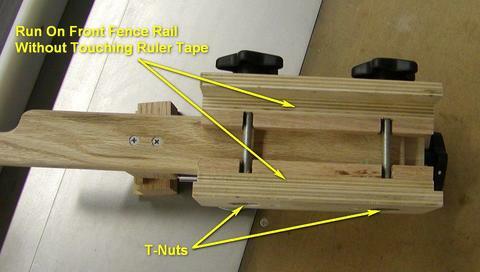 The fence locking mechanism is a T-Square arrangement. 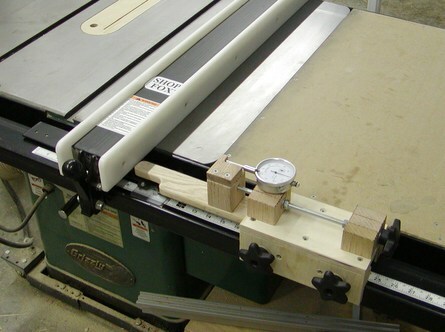 Once the Fence Locking Lever is released, there is nothing there to keep the fence square to the table saw. Once the Fence Locking Lever is again locked, then everything is once again square with the table saw. I wanted a mechanism, that would clamp to the front fence rail and would allow for incrementally small changes in fence position (a few thousandths of an inch at a time) to aid in "fine-tuning" the position of the fence. It is difficult to come up with a removable mechanism, which will push & pull the fence. My Micro-Adjust essentially becomes the "new mechanical point of reference" once the Fence Locking Lever is released. Assume the fence is initially set to the desired position. 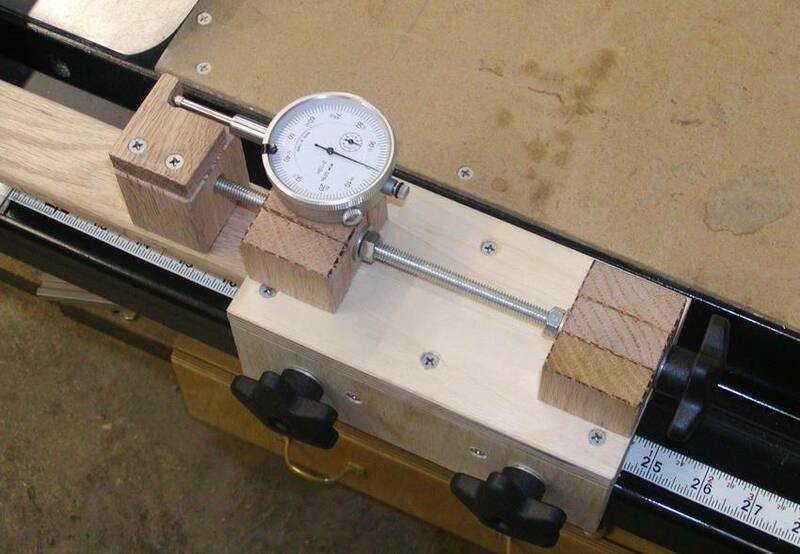 You make a cut with the table saw and then you decide (discover) you would like to change (increase or reduce) the measurement a few thousandths of an inch. DO NOT release the Fence Locking Lever. Pre-Load the dial indicator to .500 inch (mid-range point on the dial indicator). This mid-range point allows for ½ inch change in either direction. Begin turning the Fence Pusher Adjustment Knob in the desired direction of travel (to take up back-lash in the threads) and zero the dial. Slide the Micro-Adjust mechanism along the Front Fence Rail until the Fence Pusher is snugly against the backside of the table saw fence. Lock the Micro-Adjust to the Front Fence Rail using the two locking knobs. NOW you can release the Fence Locking Lever. 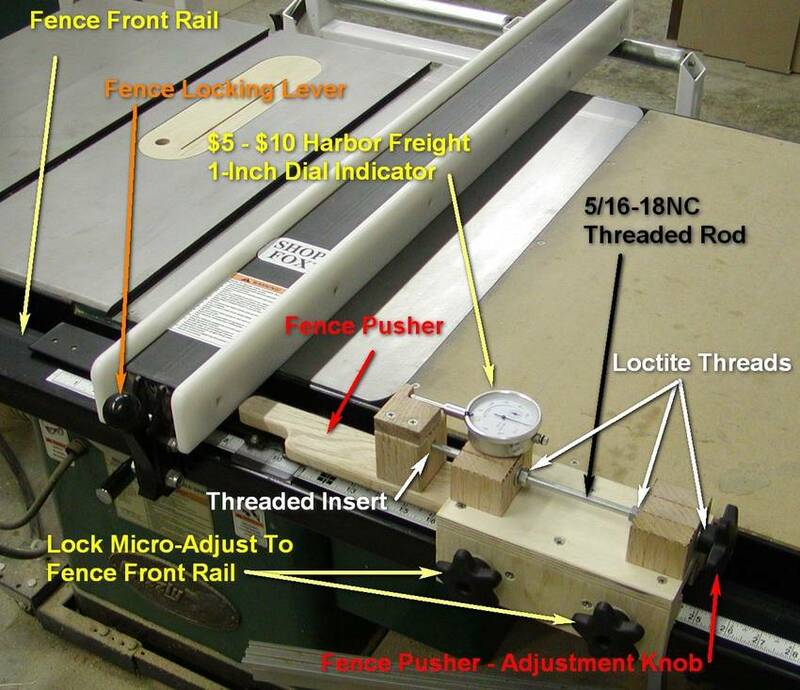 Turn the Micro-Adjust Fence Pusher Adjustment Knob until you have the desired change in dimension. 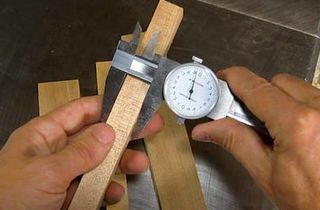 If the change in measurement is smaller, the pusher will move the fence closer to the saw blade. If the adjustment is for a larger dimension, a gap will result between the pusher and the backside of the fence. While gently holding some pressure on the fence to make certain the fence is against the Micro-Adjust pusher, lock the Fence Locking Lever. As with most woodworking, you will wish to make small changes in the fence position until you have the exact results. Will this allow you to make 0.001" adjustments? Probably not. However I have repeatedly adjusted cuts (with the use of a feather board) 0.002" to 0.004" and I expect with a bit of practice it could be better. I think this is pretty good considering the table saw and fence being used. The body of the Micro-Adjuster is made to be a snug fit on the front fence rail. The locking knobs just bend the wood slightly to grip the fence rail. The mechanical advantage of the 5/16-18NC thread is very powerful and there are two of them. This was a prototype to see if it would work. Obviously, this mechanism needs to be tailor-made to accommodate the fence on your particular table saw. 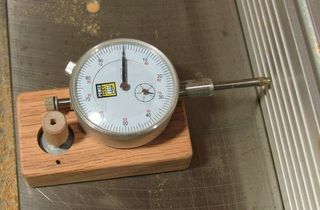 Making a Micro-Adjuster with tighter joints and a fine thread rod would probably give better adjustments.